Amateurs have a tendency to peep everywhere they can. The reason being that they learn about kikashi and are eager to apply the concept. Everyone likes free things, right? Peeping first and asking questions later can be a bad habit, however. Aside from the fact that it can be aji keshi (see Don't peep where you can cut, for instance), there is a great danger of self indulgent reading. Most of the time, when a kyu player peeps with , he expects as a matter of course. This sort of optimism is often reinforced by the opponent, who goes along with it without thinking. However, other ways to connect will often exist. Sometimes they will just be lighter or more efficient ways to connect, that help with eye shape, or do some incidental damage to the peeper's position on the other side. The most painful punishment for a bad peep, however, is to find a way to connect in sente. Then the whole purpose of the peep has been defeated; rather than making the opponent heavy in sente and continuing the attack, he has lost sente, and allowed the defender to seize the initiative. One (less-than-perfect) example. If someone can come up with a better one, or provide one from one of their games, please do so. 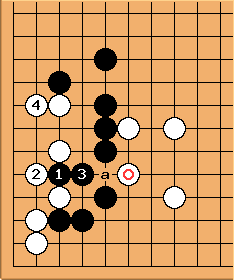 My problem with this example is that B had rather bad aji in the corner to start with and W has partially fixed it in his efforts to gain sente. One must therefore evaluate the overall position before deciding to play here. It may be better to connect solidly and accept gote to leave weaknesses in the corner. Another option would be to play at instead, living in the corner and treating the outside stones lightly. 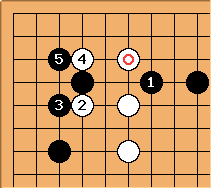 However, it serves to illustrate the general idea; that the opponent's position on the side opposite the peep may provide sente moves or kikashi of one's own that connect (or create options that are as good as connection) in sente. One more example, this one taken from Yu Chang Hyeok's book, Kong-gyeok No-ha-u? (Attack Know-How). He is playing B himself, Rin Kaiho is white. This is the actual game continuation. B can be considered connected, because a would be more or less sente, so if W tried to cut, he could play there and then b. 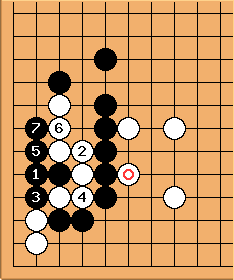 After , B took sente to play c, which led to him swallowing up W's kikashi stones and starting an attack of his own on the W stones to the right. He gives this as the principal variation. 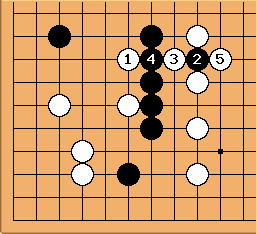 Like this, B ends up making the solid connection at , but has gained something because W would never answer at if was already on the board. By getting that answer first, he forces W to take gote to capture with , or else leave some very bad aji in his position. 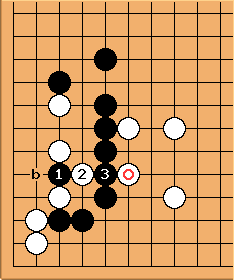 Needless to say, before doing something like this, you must make sure that the ponnuki W gets won't be useful (in this case, B had a position in the lower left, and would have used sente to solidify it so W's thickness goes to waste, had W chosen to play this way. Charles I remember something written in an old BGJ - in reply to a pro saying a play was standard, an amateur 2 dan saying he wished he could find such things in a game. Here the point is that can be played, but then after , White has big worries about Black at b later. If White plays b to capture, right now, then the peep at turned out to be gote, so Black will be happy. 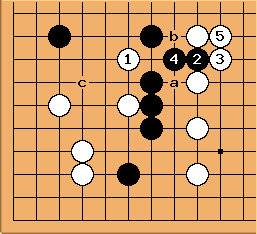 One variation: White gets into big trouble. Thad: You misunderstand a beginners motivation. Typically a beginner peeps or cuts prematurely not to utilize kikashi, but to take advantage of the peep or cut before his opponent makes a play to remove the opportunity. "Peep while the peeping is good" is the atitude. Please comment on this page. Feel free to provide more/better examples, or suggest rewording of the proverb.